2016 was a record year at the box office – and in my opinion one of the best ever in terms of quality – for animated movies. 2017 has been having an opposite effect in both cases. The domestic box office total for 2017 animated movies is at $1.25 billion, making it the 6th biggest year for the genre since 1998. However, it’s a whopping 48% less than last year’s record total of $2.44 billion. “Ferdinand”, opening Dec. 15, is the last major release of the year. Blue Sky has never had a non-“Ice Age” movie gross more than $155 million. “Ferdinand” doesn’t have much direct family competition outside of “The Greatest Showman” (also distributed by Fox), so it has a great chance of doing very well over the holidays. The studio is certainly hoping that while the story seems to skew young, the casting of John Cena as Ferdinand might not be enough to draw-in teens and twenty year olds. 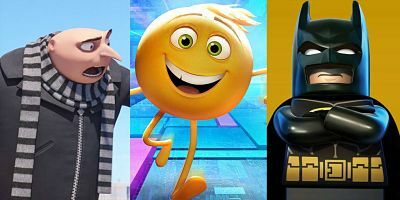 Many of this year’s crop of animated films were specifically aimed at the kid and pre-teen crowds, resulting in low totals: “The Emoji Movie” ($86M), “Captain Underpants: The First Epic Movie” ($74M), “Smurfs: The Lost Village” ($45M), “The Nut Job 2: Nutty by Nature” ($28M), “Leap!” ($22M), “My Little Pony: The Movie” ($22M) and “Rock Dog” ($9M). “Despicable Me 3” could also be put into that category. This third chapter wasn’t nearly as funny, exciting or deep as the first two – with very little appeal to anyone over 12. But it’s the year’s top animated grosser so far with $264 million (more than $100M less than “Despicable Me 2” – clearly not as much repeat business). Pixar’s “Cars 3” received some of the best reviews of the franchise, but the six-year gap since “Cars 2” didn’t help, resulting in a franchise low $153M. The studio’s “Coco” just passed the $100 million mark, though it likely won’t double that by the end of its run. Two “LEGO” movies in the same year didn’t work for Warner Bros. “The LEGO Ninjago Movie” (released in September) ended-up with just $59 million. Sony’s third 2017 release, “The Star”, may have a chance to cross $30 million by Christmas, but it won’t go beyond that figure. Only a couple of 2017 animated releases had teen, young adult and adult appeal. “The LEGO Batman Movie” was a success, bringing-in families the core DC superhero fans. “The Boss Baby” benefited from the casting of Alec Baldwin. Both made $175 million – still not stellar compared to other movies in other years, but they’re 2nd and 3rd for ’17. When it comes to how good these animated movies are, my favorites for the year are two indies “Loving Vincent” and “The Breadwinner”. I also enjoyed “LEGO Batman” and “Captain Underpants”, followed by “Cars 3” and “The Star”. But there were six stellar animated films last year (including “Kubo and the Two Strings”, “The Little Prince” and “My Life as a Zucchini”) and a handful of other good ones (like “Kung Fu Panda 3” and “The Angry Birds Movie”). The powerhouse punch just isn’t there this year. So, don’t simply blame the sharp decline on last year being a record high, or a “2” or “3” in a title: it’s the quality and the target demos.